The term curry can be a bit misleading because it includes so many different types of dishes from India or south Asia and it could mean almost anything since the word curry basically means “stew”. We usually recognize them from the use of coconut milk as well as an elaborate blend of spices that are typically used in Indian cooking. Coriander, turmeric, cumin, nutmeg, cinnamon, fennel seeds and ginger are only a few of them. Instead of over-complicating things here, we’ll use curry powder, which is a prepared blend of some of those spices used especially for the purpose of making curries. The following curried shrimp recipe is very quick and simple to prepare and requires only a few basic ingredients. It’s so easy and quick that it’ll be ready in less then 15 minutes. It’s a great way to prepare delicious shrimp, which are too often forgotten in our day to day meal planning. Nutritionally, we know that spinach is loaded with a multitude of nutrients like magnesium, iron, calcium, vitamin K and selenium. 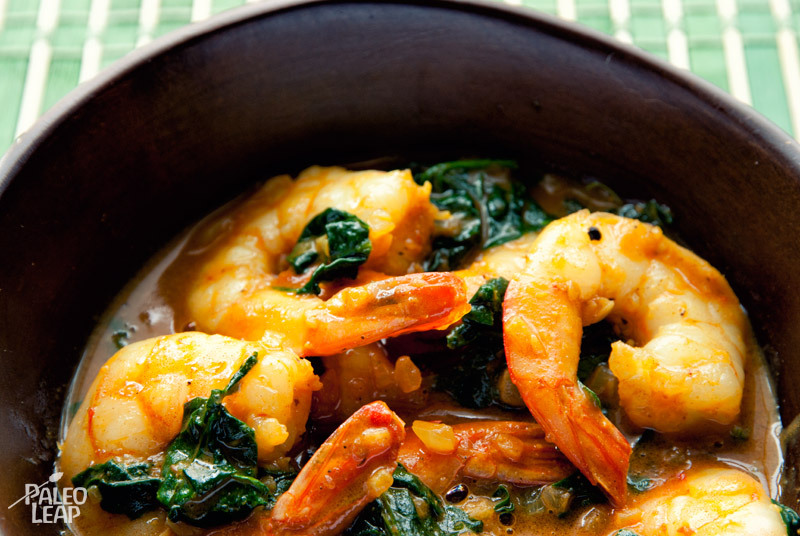 Shrimp for their part are a great source of vitamin B12 and selenium. Clarified butter (ghee) or coconut oil are the two best choices to prepare this dish because curries taste amazing with butter and coconut undertones and are traditionally prepared with ghee in India. Heat a large skillet over a medium-low heat and cook the onion in the ghee, butter or coconut oil until it begins to soften, about 3 minutes. Season to taste with sea salt and freshly ground black pepper, stir in the curry powder and continue cooking for a minute. Place mixture in a blender or a food processor, add the tomato paste as well as the chicken stock and coconut milk. Process or blend until smooth. Pour the mixture back in the skillet and bring to a simmer. Add the shrimp and spinach and cook, covered, for about 5 minutes, until the shrimp are just cooked.